“…the ubiquitous M16 assault rifle, a humble enough weapon until you see it in the hands of a man outside your local bowling alley or 7-11. It will be noisy, it will be scary and it will not be ignored for a VFW parade” – General Deveraux (the Siege) in reference to declaring martial law in New York City. The recent imposition of martial law in Thailand, Egypt and parts of Ukraine highlights the dangers and benefits of imposing martial law. The term “martial law” has an ominous ring to it, especially in those countries founded upon notions of individual rights and privileges. Martial law is defined not as law in the ordinary sense, but rather, the exercise of military authority, coupled with the temporary suspension of some or all of the functions of civil government. Normally, martial law is only instated in times of war; but during times of peace, when faced with domestic upheaval or natural disaster martial law is occasionally required to impose order. Often times, military rule is essential to re-impose order and defeat factions challenging state authority. However, martial law also has been utilized to gain political power or to repress legitimate opposition. Admittedly, much like Julius Caesar crossing the Rubicon in 49 BC, even with the best intentions, imposing martial law has severe ramifications. Consequently, although martial law, is necessary tool for any regime, it should be utilized sparingly, as it can lead to many unforeseen consequences. These unforeseen consequences might include: decay in public opinion concerning the ruling regime and the military, increased possibility of military coups, infringement on individual rights, and continued utilization of the military in politics by various actors. Members of armed forces should also hesitate to become involved in instating martial law, since these consequences may be significant and long reaching, largely because martial law legitimizes the use of force. Therefore, if policy pitfalls are to be avoided, a careful examination of various instances of martial law should be done. 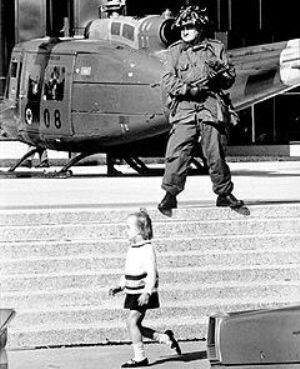 The “Good” – October Crisis 1970. In the fall of 1970, a radical Quebec separatist group, the Front de Liberation du Quebec (FLQ) kidnapped the British trade commissioner James Richard Cross from his Montreal residence. The FLQ had been involved in over 200 bombings in Quebec since 1963, with an agenda for achieving Quebec independence by any means. 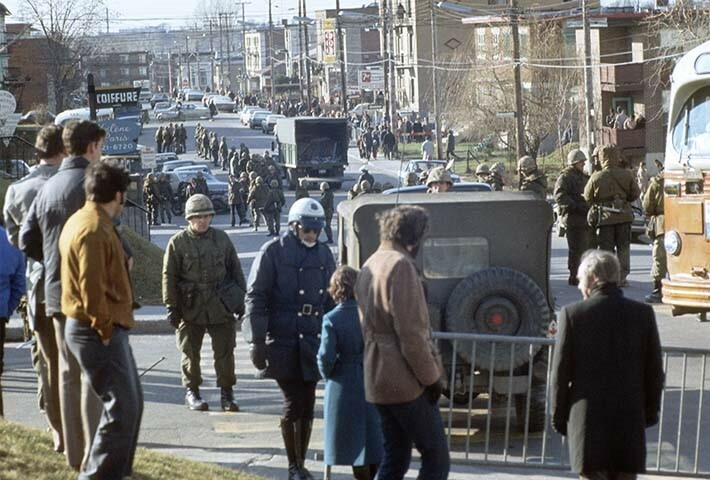 At first the government response was limited, with very public negotiations between the regime and the FLQ. However, the kidnapping and subsequent strangling of Quebec Minister of Labor, Pierre Laporte by a cell of the FLQ dramatically changed the nature of the crisis. Panic rippled through the public, and gave the impression that the regime was losing power. The young Premiere of Quebec, Pierre Trudeau, a lifelong champion of individual rights, turned to the national government for help. 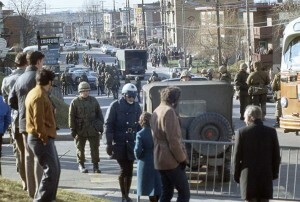 The national government responded by invoking the War Measures Act, and instituting martial law in the greater Montreal area. Troops were utilized to guard vulnerable points and important individuals as well as to support the role of civil authorities such as the police in their investigative efforts. The Canadian army and police conducted 3000 searches and detained 497 individuals within the first 24 hours. While Habeas Corpus (the individual’s right that a judge confirms they have been legally detained) was suspended, and some accused were held for 21 days without legal counsel, the cell members responsible for Laporte’s death were arrested and charged with first-degree murder. Assuredly, any suspension of civil liberties and the imposition of military rule on a civil population should be a last resort, but as the Canadian example demonstrates, having strict controls and overall civil authority with the military playing a subordinate role in martial law may lead to less misuse of the military and martial law. 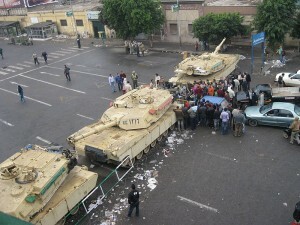 Figures 3 & 4: Thai troops and Egyptian tanks imposing martial law. In sharp contrast, as recent events in Thailand and Egypt demonstrate, having the military play the role of final arbitrator on political issues, in conjunction with successive use of military force in suppressing political dissent and opposition will lead to more overt military intervention in political affairs. 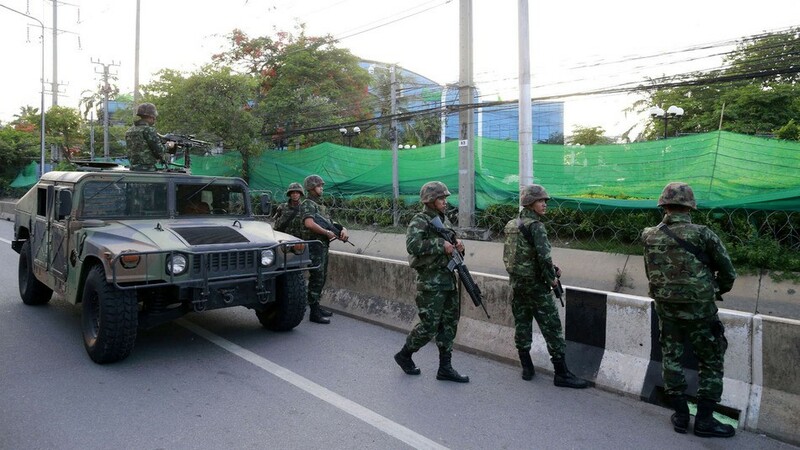 The fact that the Thai military plays a dominant role in the politics of Thailand is well known to the world. The coup of 1932 marked the point when the Thai military crossed into the political sector from which has never quite retreated. Additionally, in Egypt, the military and martial law have become tools for the consolidation and maintenance of political power. Consequently, it has become very difficult for citizens to either distinguish between the military just reasserting order or obtaining control over the reins of political power by establishing martial law. The “Ugly” – New Orleans, 2005 & parts of Ukraine, 2014. In 2005, Hurricane Katrina led to a breakdown of effective governance in New Orleans, Louisiana. While the term martial law does not exist in Louisiana’s constitution, a form of emergency management akin to martial law was used to address the widespread violence and disorder. The primary forces tasked to restore order were the New Orleans police department and the Louisiana National Guard (LANG), with federal troops primarily deploying medical, search-and-rescue as well as other forms of relief. Those forces instating martial law faced significant opposition from citizens who were attempting to protect their private property through personal firearms. However, considering the rising rates of violence in the face of relief efforts, military and law enforcement forces had little choice but to infringe on the rights of individuals. The crisis highlighted the challenge of ensuring public safety and effective governance at the expense of the rights of individual bringing the issue into contemporary American political discourse. In a similar way, the government of Ukraine faced a similar dilemma when instating martial law. In February 2014, as the pro-western movement gathered momentum, President Yanukovych granted increased powers akin to martial law to the army and police. However, the increased repression only emboldened the pro-western groups eventually leading to the ousting of the President. A few months later the temporary pro-western regime now faces a similar dilemma in combating the rising pro-Russian separatists in the eastern parts of the Ukraine. By declaring martial law, the pro-western regime in Kiev may alienate supporters or even embolden opponents as Yanukovych did. Nevertheless, with rising violence in certain regions, such as Luhansk Oblast, the regime might to impose instated martial law, or face a public backlash against ineffective governance. In times of peace under martial law, a soldier, for the time being, becomes a glorified policeman, with powers greater than those of an ordinary peace officer, but ideally is still under civilian control. The soldier is tasked to restore order in the aid of the civil authority, which for the moment has been submerged either by natural forces or actors attempting overthrow the existing regime. A government establishing martial law should assure the public that such a step is necessary and temporary and that civil control over the military remains in effect. The military forces carrying out martial law when it is necessary, should behave with restraint and seek to restore full civilian control as quickly as possible. If you have any questions or comments please contact Werner at wgs10@pitt.edu. This entry was posted in Werner Selle's Analysis by Administrator. Bookmark the permalink.